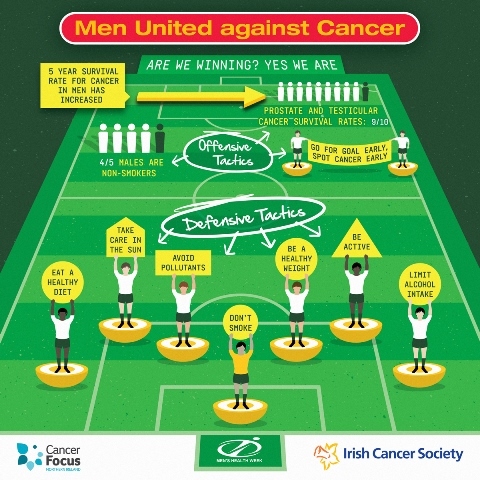 Every year around 6,000 men in Northern Ireland are diagnosed with cancer (including about 1,900 who have the less serious non-malignant melanoma). That is a startling statistic, but our men’s health work can help you lower your risk. Over half of all cancers can be prevented with a healthier lifestyle. Our men’s health Man Alive project brings essential health messages and health checks directly to you in your community, encourages you to take positive steps to improve your health, and to talk to your doctor early if you have any concerns. Our Man Alive Man Van is a mobile service with specialist staff who give men’s health checks and one-to-one cancer awareness sessions at various venues including football grounds, sports clubs, leisure centres, workplaces, colleges and community centres – anywhere where men live, work and play. For further information or to book the Man Van for your venue or workplace contact us on 028 9066 3281 or email behealthy@cancerfocusni.org.